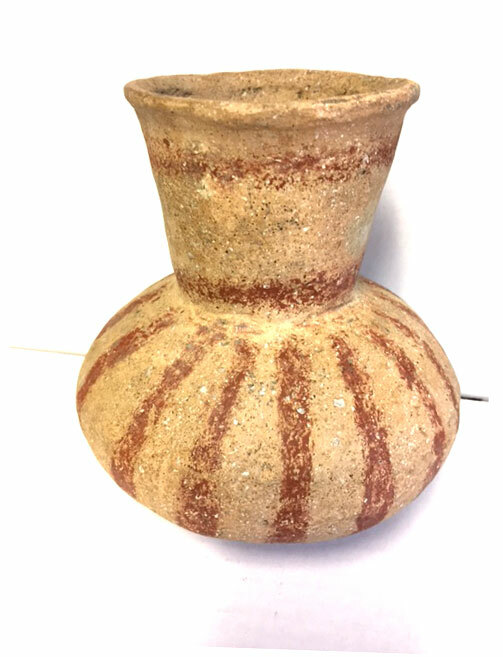 A Medium Size, Very Well Made, Solid Condition, Late Mississippian And Proto-Historic Quapaw Period, Carson Red On Buff Waterbottle That Exhibits Surface Oxidation Aging And Overall Clay Coloration Dulling Patination, Correct Bottom Use Wear, Visible Interior Aged Extended Ground Placement, Correct Vessel And Paint Application Combination, Correct Material And Manufacture For The Area Found. Found At The Payne-Riggs Site In Mississippi County, Arkansas, By Lloyd McKinney. Ex-Lloyd McKinney And Tommy Bryden Collections. This Excellent Example Has A Nice Paint And A Disc Base! Includes A Ken Partain Certificate Of Authenticity.